Now with two bonus instructional DVDs, The Knitter's Companion Deluxe Edition with DVD is every knitter's perfect reference guide! Chock-full of techniques, illustrations, and definitions, this resource has everything you need for knitting with confidence. Inside you'll find an overview of stitches, gauges, joins, seams, borders, and buttonholes, as well as detailed descriptions of each technique and photographs that show the finished look. Innovative methods are also explored in The Knitter's Companion Deluxe Edition with DVD, including additional ways to cast on, bind off, and increase stitches. Vicki Square shares an abundance of detail on color knitting techniques, plus favorite embellishments such as tassels, fringe, knitting with beads, and more. Vicki also shares with you in two extended DVDs every technique featured in the book. 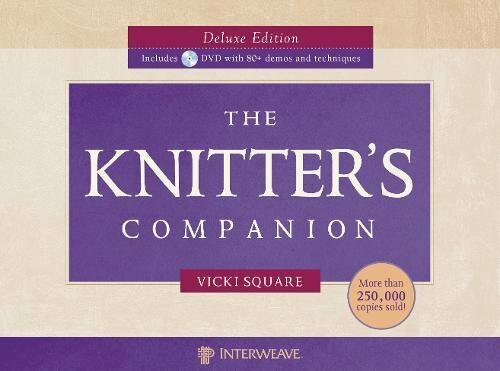 Starring in more than five hours of instruction on the DVDs, Vicki shares with you a truly hands-on knitting experience. All the information knitters need is right at their fingertips with The Knitter's Companion Deluxe Edition with DVD--an indispensable addition to any knitter’s bag of tricks. If you have any questions about this product by Interweave Press, contact us by completing and submitting the form below. If you are looking for a specif part number, please include it with your message.